On Haier's stand at CES they're displaying some innovative wireless TVs. 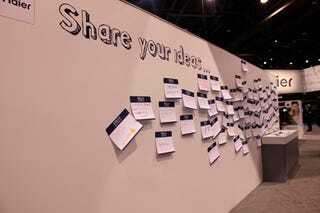 Helping breed innovation amongst the stand-goers, they've also got a wall asking people to "share your ideas." Let's hope the following ideas came from contained Vegas locals, at least. What, you mean like 3D TV? Did you even PAY ATTENTION when you walked through Central Hall to Haier's stand?! I dunno, guess you're just not looking hard enough. I found a screen cleaner wipe in a condom wrapper. I want whatever rock this person's living under, if he's never seen an iPod Shuffle in his life. You mean you DON'T want to look like these guys? I love that someone corrected the original writer, saying "it does exist," and then some lone rambler got all over-excited and had to exclaim "finally!!11!!!1!" on it. Class. That's not necessarily a good thing, you know. Last year at CES, a friend of mine got flashed at in the men's loos. I've been holding on since I got here on Monday. Actually...that's not such a bad idea.